This form is a purchase agreement whereby one hosting company sells a pool of its subscriber accounts to another website hosting concern. The agreement contemplates a cash sale using an escrow set up with a financial institution. Within seven days after the closing, the seller is to provide to the buyer a copy of all third-party-verification recordings (“TPV Recordings”) for each of the purchased subscribers. If such TPV recordings are not available for selected subscribers, the portion of the purchase price allocable to them will be refunded to the buyer. The agreement contains a fairly extensive list of seller and buyer warranties and representations in connection with the sale. Only liabilities associated with the website or transferred accounts are assumed by the buyer. The form contains a post-closing mechanism to adjust the purchase price based upon the number of accounts actually transferred, and the rate of cancellations by subscribers included in the transferred accounts. A. Seller is in the business (the “Business”) of providing web hosting services to small businesses (“Subscribers”). B. Seller desires to sell, and Buyer desires to purchase, certain Subscribers of Seller set forth in Exhibit A attached hereto (the “Purchased Subscribers”). “Affiliate” means, with respect to any Person, any other Person controlled by or under common control with such Person, with “control” for such purpose meaning the possession, directly or indirectly, of the power to direct or cause the direction of the management and policies of a Person, whether through the ownership of voting securities or voting interests, by contract or otherwise. “Consents” means all of the consents, permits or approvals of third parties (excluding the Purchased Subscribers themselves) necessary to transfer the Purchased Subscribers to Buyer (or, at Buyer’s request, to an affiliate of Buyer) or otherwise to consummate lawfully the transactions contemplated hereby. “Contracts” means all subscriber agreements and other agreements, written or oral (including any amendments and other modifications thereto) to which Seller is a party and that affect the Purchased Subscribers. “Governmental Authority” means the United States of America, any state, commonwealth, territory, or possession thereof and any political subdivision or quasi-governmental authority of any of the same. “Judgment” means any judgment, writ, order, injunction, award or decree of any court, judge, justice or magistrate, including any bankruptcy court or judge, and any order of or by any Governmental Authority. (b) a prudent individual could be expected to discover or otherwise become aware of such fact or other matter in the course of conducting a reasonably comprehensive investigation concerning the existence of such fact or other matter. A Person (other than an individual) will be deemed to have “Knowledge” of a particular fact or other matter if any individual who is serving, or who has at any time served, as a director, officer, partner, executor, or trustee of such Person (or in any similar capacity) has, or at any time had, Knowledge of such fact or other matter. “Legal Requirements” means applicable common law and any statute, ordinance, code or other law, rule, regulation, order, technical or other standard, requirement or procedure enacted, adopted, promulgated, applied or followed by any Governmental Authority, including Judgments. “Licenses” means all authorizations and permits relating to the Purchased Subscribers granted to Seller by any Governmental Authority. “Lien” means any security agreement, financing statement filed with any Governmental Authority, conditional sale or other title retention agreement, any lease, consignment or bailment given for purposes of security, any lien, mortgage, indenture, pledge, option, encumbrance, adverse interest, constructive trust or other trust, claim, attachment, exception to or defect in title or other ownership interest of any kind, which otherwise constitutes an interest in or claim against property, whether arising pursuant to any Legal Requirement, Contract or otherwise but which shall not include any rights to payment or obligations imposed upon Buyer as a result of this Agreement or any ancillary documents. “Litigation” means any claim, action, suit, proceeding, arbitration, investigation, hearing or other activity or procedure that could result in a Judgment, and any notice of any of the foregoing. “Losses” means, on a dollar-for-dollar basis, any claims, losses, liabilities, damages, Liens, penalties, costs, and expenses, including but not limited to interest which may be imposed in connection therewith, expenses of investigation, reasonable fees and disbursements of counsel and other experts, and the cost to any Person making a claim or seeking indemnification under this Agreement with respect to funds expended by such Person by reason of the occurrence of any event with respect to which indemnification is sought, but in no event shall “Losses” include incidental or consequential damages. “Material Adverse Change” means, with respect to Seller, an event that would either individually or in the aggregate, reasonably be expected to have a material adverse change on the Business or the Purchased Subscribers, or the results of operations or financial condition of the Business or the Purchased Subscribers sold hereunder, other than any change or condition relating to the economy in general, or the industries in which Seller operates in general, and not specifically relating to Seller. (f) any amendment to any of the foregoing. “Person” means any natural person, Governmental Authority, corporation, general or limited partnership, limited liability company, joint venture, trust, association or unincorporated entity of any kind. “Taxes” means all levies and assessments of any kind or nature imposed by any Governmental Authority, together with any interest thereon and any penalties, additions to tax or additional amounts applicable thereto. “Transaction Documents” means all instruments and documents executed and delivered by Buyer, Seller, or any officer, director or Affiliate of either of them, in connection with this Agreement. (vii) references to a “day” or number of “days” shall be interpreted as a reference to a calendar day or number of calendar days. (d) all books and records relating to the Purchased Subscribers, subject to the right of Seller to have such books and records made available to Seller for a reasonable period, not to exceed three years from the Closing Date. 2.2 Assumed Obligations and Liabilities; Retained Liabilities. After the Closing, Buyer shall assume, pay, discharge, and perform all obligations and liabilities arising after the Closing that are related to the Assets or arise from or under (i) Buyer’s or its Affiliates’ use of the Assets or provision of services to the Purchased Subscribers, or (ii) the Contracts (collectively, the “Assumed Obligations and Liabilities”). All obligations and liabilities arising out of or relating to the Assets other than the Assumed Obligations and Liabilities shall remain and be the obligations and liabilities solely of Seller (collectively, the “Retained Liabilities”). 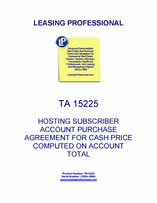 2.3 Purchase Price; Final Format Data; TPV Recordings; Purchase Price Adjustment. (a) Purchase Price. Buyer shall pay to Seller up to ______________ US Dollars ($_________) (the “Purchase Price”), which amount is based upon the transfer of up to ___________ Purchased Subscribers. The Purchase Price is payable as set forth below. (i) At the Closing, Buyer shall pay to Seller by wire transfer to the account and pursuant to the instructions set forth on Schedule 2.3(a)(i) an amount equal to (i) the Purchase Price minus (ii) the Seller Escrow Deposit. (ii) At the Closing, Buyer shall deposit the Seller Escrow Deposit with Escrow Agent pursuant to Section 2.4.